I never met a group antique shop I didn’t like – tons of treasures all under 1 roof. I have been to group shops all over New England as I am a lifelong treasure hunter. Here are a few of my favorites that are not to be missed! Who couldn’t love a group shop that is an an old department store building that still has a working lunch counter? The Laconia Antique Center is located in a former Newberry’s Department Store built in the 1950’s. 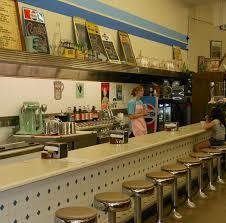 You can enjoy breakfast or lunch or have an ice cream at the counter while listening to the jukebox. There is no better way to set the mood for a day of antiquing with over 150 dealers in 22,000 (yes 22,000!) square feet. This place is close to my heart and close to my home so I am a frequent flyer! In addition to over 90 dealers this place knows how to treat their customers. Lots of sales and more often than not there are home baked goodies out on the counter. There is an interesting mix of antiques, vintage and “grandma’s attic” type goods. Hard to classify everything as antique here. If you are looking for a stuffy, highbrow shop this won’t be your cup of tea! They recently turned one of their floors into a space for handcrafted items which disappointed me but I’ll still be visiting – if not for the vintage items it will be for the cookies! This shop is fairly new but it is growing quickly. 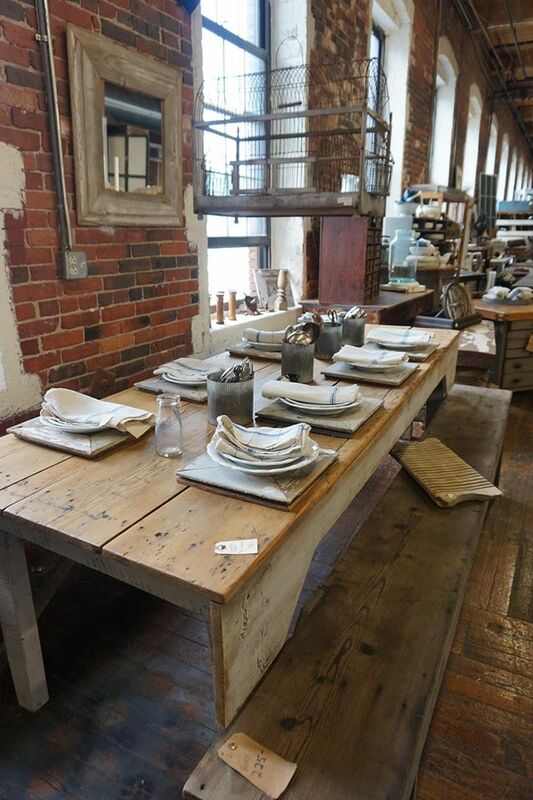 Honestly, I am drawn to any antique store that is in an old brick mill building – I just can’t resist! I grew up in a mill city and I’m oddly comforted when I’m surrounded by old brick walls – go figure! The proprietor is lovely and always helpful. I love when they have an occasional outdoor flea market as it is a great opportunity to snag some bargains. Their storefront is also quirky and always evolving – just like me! Yeah, I know, another mill building… but in the Merrimack Valley in Massachusetts it doesn’t get any better than this place! Over 50 dealers in 18,000 sq. feet of glorious mill space. Free appraisals on Wednesdays. Unlike a lot of other group shops, this place has a good amount of furniture too. Like industrial? You can usually find a good amount of this trendy look. This shop in located in my hometown – a mill city on the Merrimack River. I’m always on the hunt for Lawrence memorabilia and this place never fails to satisfy. Epic Yard Sales – Several times a year they host yard sales in their parking lot and rent table space for only $20 bucks! You’ll find lots of part-time pickers who are looking to unload their treasures at a bargain price! 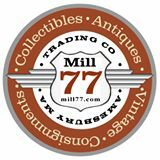 Branding – I appreciate good branding and marketing and Mill 77 does a good job promoting the shop and keeping customers informed. Free Popcorn and Coffee – The popcorn keep my daughter happy while we shop and the coffee keeps me alert so I am sure to spot a bargain! I spend lots of time hunting! What do I do with all of these treasures? Share them with you of course at Lizzie Tish Vintage!